In the latest version of the German Energy Savings Ordinance (EnEv) of 2009, the German federal government reduced the maximum permissible energy requirement for new buildings by 30% compared to the EnEv of 2007. In the next step, energy stipulations are set to become stricter by a further 30% in 2012. These targets will also apply to renovations. This will make heating systems employing renewable energies and home ventilation systems that extract heat from the exhaust air to heat up the fresh air indispensable. At the same time, the energy efficiency standards expected of such solutions are very high, which in turn has an effect on the components employed. This also affects fans, which already have to satisfy very high standards with respect to efficiency. Naturally, implementing the required energy efficiency means higher costs for the home builder, regardless of whether it is a new building or a renovation. However, “environmentally compatible” does not necessarily have to mean “expensive” in the long run. Firstly, the financial “energy-saving premium” will in time pay for itself – regardless of future energy prices. Secondly, state subsidy schemes relieve the financial burden. Builders of new buildings can take advantage of loans from the KfW (the German state banking group for reconstruction), whose interest rates and possible repayment subsidies depend on the level of efficiency achieved. If you wish to renovate an existing building, you have the choice of a wide range of subsidisation standards. Even if the current subsidy schemes fall victim to future cutbacks, the energy saving measures are still worthwhile for both new buildings and renovations, and not just for environmental reasons. Good insulation and ventilation enhances the general comfort of the house, and the increase in the value of the property should also not be neglected. 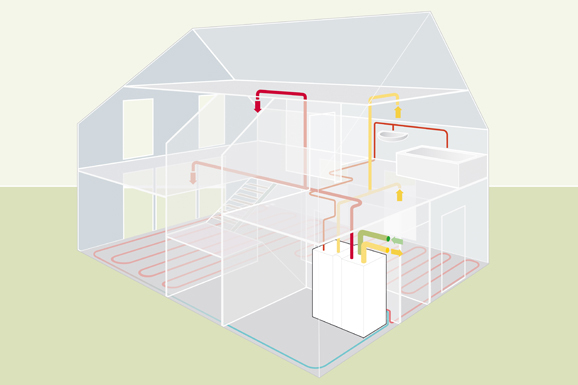 Home ventilation systems with heat recovery are especially suitable for low-energy and passive houses, but they are also employed in the renovation of older buildings. For apartments and single-family homes, central systems are usually employed (see box text). Here, the fresh air and the exhaust air are conveyed through ducts by two fans. 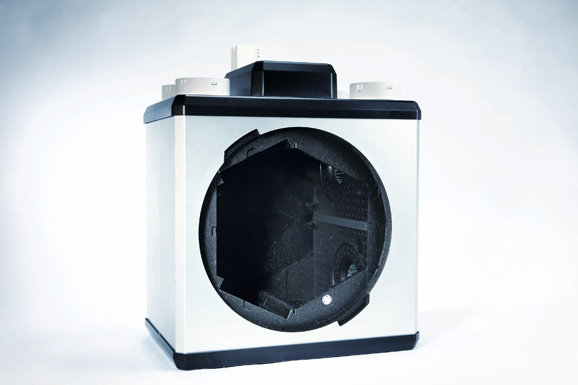 Heat recovery and air filtration are managed by the central unit, which can be placed practically anywhere, e.g. in the cellar. The fans for the fresh air and exhaust air form the “heart” of the system. They are required to work reliably and energy-efficiently as such ventilation systems are usually in continuous operation. Moreover, it is essential for low-noise and low-vibration motors and fans to be used. Because the ventilation ducts are routed throughout the building, droning motors would cause significant noise disturbance. At the end of the day, nobody wants to hear a thing from the ventilation. The drive employed is a key criterion when selecting the right fan. Today, “asynchronous motors” are still employed to drive fans in ventilation and climate control systems. These AC motors are of a straightforward design and are powered directly from the A/C or three-phase current supply. Neither mechanical collectors nor electronics are needed to power the armature. They are robust and reliable, but they have one decisive drawback: depending on the design, the are only able to achieve an efficiency rating of about 50%. The efficiency describes the relationship between the achieved mechanical output and the electrical input. In other words, it is a measure of the energy efficiency of a drive. 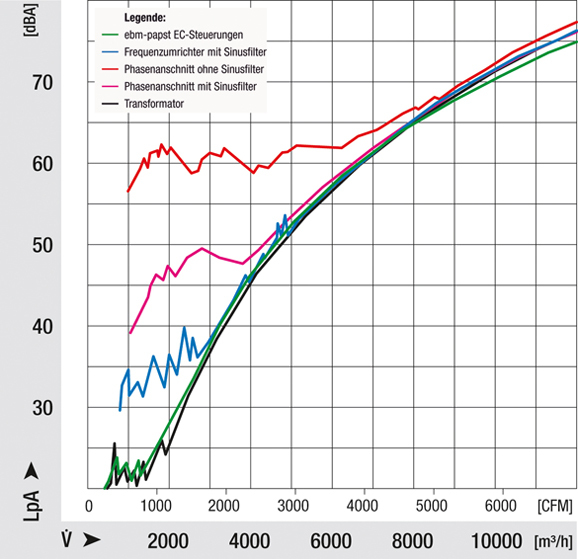 Modern EC drives, specially developed by motor and fan specialist ebm-papst for use in home ventilation systems, perform substantially better in this respect, which is due to the way they work. On the EC motor, a magnetic rotor synchronously follows an electronically generated rotating field. EC motors are direct current motors that are straightforward to control. They work with an efficiency of up to 90%. Operating costs are reduced, the climate control solution pays for itself relatively quickly and significantly less CO2 is created from the very first minute of operation, reducing the impact on the environment. At the same time, the drives are also remarkably quiet. The key to this is the especially low-noise commutation. Apart from the motor, the geometry of the blades is an important factor when choosing the right fan. For home ventilation systems, centrifugal fans are employed, where a distinction has to be made between forward and backward curved blades. In home ventilation systems, forward curved centrifugal fans are predominantly employed. 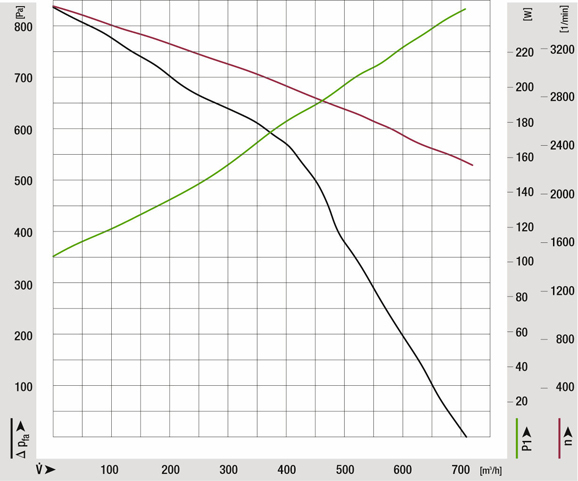 Here, the relationship between the power input, speed and air flow is approximately linear. That means that the air flow can be calculated using the speed and current draw, and the air flow can be controlled without an air volume sensor. The electronics integrated in the EC motor takes care of these additional control functions. The sensorless air flow control also creates further advantages. This means that there is no reduction in air flow caused by contaminated filters. Moreover, the regulation of the air flow is more straightforward when the system is set up, which is an additional cost factor that should not be underestimated. 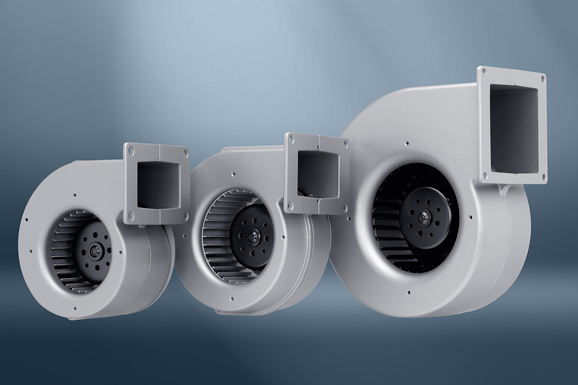 Because the necessary air flow depends on the size of the space to be ventilated, there are different centrifugal fans available with GreenTech EC technology for air flows of up to 180 m³/h, 300 m³/h and 400 m³/h. 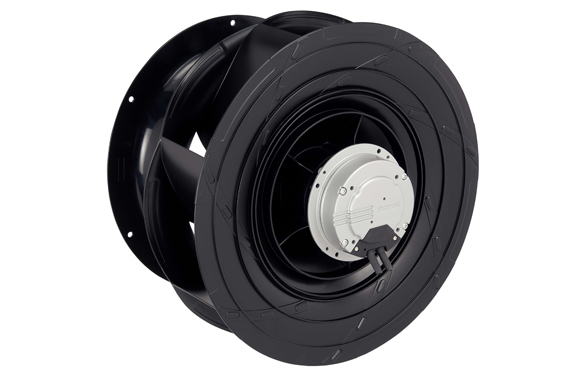 These fans are housed in a compact scroll housing and are directly connected to the 230V AC voltage supply with a frequency of either 50 or 60 Hz. The required air flow can be set using either a pulse width modulation signal or a variable voltage between 0 and 10 V.
The speed monitoring function integrated into the motor electronics emits one pulse per revolution. Various devices can be connected to this output, for example a counter, controller, alarm transmitter or a speed indicator. There is no need for a anti-vibration mount as the three-core design of the EC drive and the optimised commutation technique prevent motor noises from being generated. These advantages can of course also benefit decentralized ventilation systems. Here, there is also a wide range of powerful fans that combine energy-efficient EC technology with quiet running and a range of practical control and regulation options. Another interesting application for efficient fans is in heat pumps (air/water and air/air). These are often combined with central ventilation systems, especially in low-energy houses. In such combined solutions, the two fans in the ventilation system are supplemented by another one for the heat pump. The “RadiCal” centrifugal fan range employs GreenTech EC technology and is very well suited to this application. Not only are these fans extremely energy-efficient, they are also very quiet. The fans are currently available in sizes 133 mm to 250 mm with drive power between 35 and 170 W, and in size 500 mm with three different EC motors with drive power 500 W, 1 kW and 3 kW. This fan range also helps to ensure not only that the energy savings that are stipulated by law are achieved, but also that they are economical for the user. When it comes to climate control in buildings, planners and operators have the choice between centralized and decentralized solutions. The market used to be dominated by centralized air-conditioning systems. Today, decentralized solutions for individual rooms or for smaller units are becoming increasingly popular as they allow individual adaptations to suit the needs of the user and detailed individual invoicing. These units are integrated directly on the facade of the building and they do not need a ducting system for the fresh air and exhaust air. This makes them perfect when renovating existing buildings. However, heat recovery and air filtration are more straightforward and more efficient with centralised systems, and maintenance work is easier to schedule and perform. This usually makes then the better option for single-family homes or multi-storey apartments.